Nathaniel “Sweetwater” Clifton was a basketball star at Chicago’s DuSable High School. In the 1942 city championship semifinals during his senior year, he scored 45 points. Clifton played one season at Xavier University in New Orleans before being drafted into the U.S. Army in 1943. He served for three years in Europe. In the post war years, he played for the Dayton Metropolitans and New York Rens. In July of 1948 Clifton signed a contract with Abe Saperstein to play for the with the Harlem Globetrotters. In 1950, Saperstein sold Clifton’s contract to the New York Knickerbockers. He was one of the first four African-American players (along with Chuck Cooper Earl Lloyd and Hank DeZonie) to ever play in the National Basketball Association. Clifton quickly became an integral part of the Knicks. He was a capable scorer, but the essence of his game was defense and rebounding. He was usually assigned to guard the opposing team’s best big man. The Knicks made the NBA finals during each of Clifton’s first three years with the team, but never won the championship. 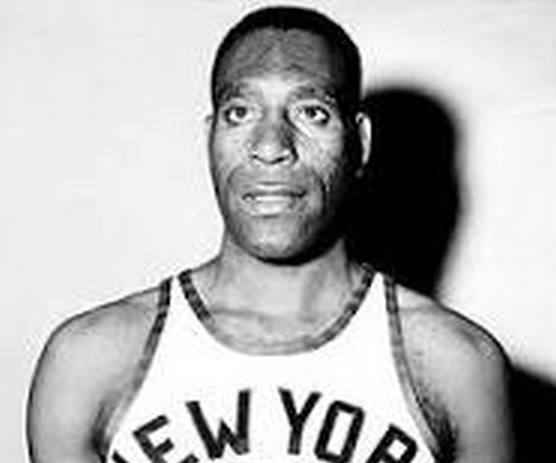 Clifton’s best year was his last with the Knicks, the 1956-57 season, when he averaged over 13 points a game and played in the NBA All-Star Game. He was traded to Detroit the next year in what turned out to be his final NBA season. In the late 1950’s he played independent ball with the the Harlem Magicians, and the Harlem Globetrotters. Clifton played for the Chicago Majors in the American Basketball League for a season and then rejoined the Globetrotters. He retired from basketball in 1963 at age 40 and returned to Chicago where he was a taxi driver until his death in 1990. Nathaniel Clifton Born: Oct 13, 1922 Died: Aug 31, 1990 Hometown: Chicago, Il.